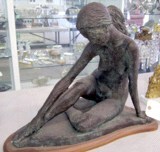 Nicely sculpted figure of a woman. Nicely carved figure of a ROOSTER. Has painted surface with a few minor chips. Shows signs of it's age. Not sure how old, but it seems to have been around for a while..
From base to top of head feathers, it measures 15 inches tall and approx 4 inches wide and 7.25 inches front to back. Nicely carved figure of a Soldier. Has painted surface with a few minor chips. Shows signs of it's age. Not sure how old, but it seems to have been around for a while..
From base to top of head, it measures 17.5 inches tall and approx 4.0 inches wide.